Mr. Hockey: The Gordie Howe Story to air April 28 | TV, eh? 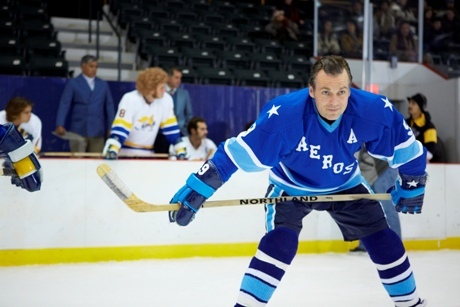 MR. HOCKEY stars Canadian actor Michael Shanks (Stargate SG-1, Saving Hope) as Gordie Howe. Hamilton native, film and television actress Kathleen Robertson (Boss, 90210) plays the compelling role of Gordie’s wife and manager, Colleen Howe. Gordie’s son Marty Howe is played by former prospective professional hockey player and actor Dylan Playfair; Playfair’s real-life roommate, actor Andy Herr, plays the role of younger brother Mark Howe. The film follows the captivating tale of Gordie Howe, undoubtedly one of the most beloved and iconic professional hockey stars of his era, as he returns to the rink for the chance to play pro hockey alongside his sons Mark and Marty. Viewers will get the chance to witness Gordie’s attempt to fulfill his lifelong dream, as he and the boys are selected to play for the Houston Aeros in the fledgling WHA league. Set in the 1970s, the movie explores themes surrounding family, dreams, pride, and of course, Canada’s most popular game — hockey. Fans won’t be able to stop themselves from cheering for the Howe boys to bring home the Cup. Joining Michael Shanks and Kathleen Robertson is Lochlyn Munro (Charmed, 21 Jump Street) as Bobby Hull; Emma Grabinsky (Knockout) as Cathy Howe; Graham Mayes (The Plague) as Murray Howe; and Martin Cummings (Poltergeist) as Bill Dineen. In addition to the challenge of playing real people, the actors had to be prepared to play hockey like the Howes. Overseeing the hockey action was hockey consultant Billy Keene.